To go along with last night’s post on Top 10 Tips for Running in the Rain, Aquaphor has offered a very generous prize package for one lucky reader! You can enter to win an assortment of Aquaphor Healing Ointment, a CamelBak Water Bottle, and a $50 Visa gift card. How great is that? While I talked in yesterday’s post how great Aquaphor is for preventing blisters when running in the rain, the Aquaphor brand is currently emphasizing the many capabilities of their multi-use Aquaphor Healing Ointment for summer. You can generate a lot of sweat during a summertime workout, so Aquaphor is great for making sure you don’t get chafing from sweaty skin. Furthermore, they suggest that it’s also helpful for protecting cuts from thorns while hiking, covering scrapes from a tumble during kickball (or just scrapes from running like a complete klutz, which I know plenty about), or even healing minor burns from a barbecue. From my own personal non-running use, I can tell you it’s also great for flip flop chafing – I live in flip flops over the summer, and walking around NYC all day can definitely do a number on my feet! Dabbing Aquaphor under the straps (assuming they’re rubber and not cloth, which can get icky) minimizes the chafing and makes me comfortable traipsing around Manhattan all day. The Aquaphor Facebook page has plenty of other skin tips, if you’d like to check it out. To enter to win, leave a comment telling me your best tip for keeping skin protected in the summer heat. You can also earn extra entries by following me on Twitter and Facebook, an extra entry for liking Aquaphor on Facebook, and finally by tweeting about the giveaway (up to once a day). Contest will run through Tuesday July 9 at 11:59pm ET, at which time winners will be chosen by random drawing. Winners will be announced on this page (if you leave your email/Twitter handle, I’m also happy to notify you that way), and they will have one week to email me in order to claim their prize. Contest entry is open to US Residents who are 18 years of age or older. Disclaimer: Aquaphor provided me with the same prize package that is being awarded to the winner, but I received no other compensation for this post, nor was I pressured to write a positive review. (In fact, as mentioned in yesterday’s post, I have been using Aquaphor since 2009 and paying for it myself!) All opinions expressed in today’s/yesterday’s post are mine alone. I have learned to lube up well, especially under my bra straps, on long runs….learned that one the hard, ouchy way! I use body glide to protect from chafing. But I will be trying Aquaphor even if I don’t win. Use sunscreen every day. For my face, I apply a moisturizer with a light SPF a well for moisture and protection! I always moisturize right out of the shower to lock all the moisture in. I use BodyGlide but now will use Aquaphor! Moisturize at night rather than in the morning! You get super gross and sticky if you moisturize before going out into the humidity. And of course, sunscreen, sunscreen, sunscreen! So. Much. Sunblock. Nothing’s worse than a Garmin tan! I need to get better about chafe prevention – I’m in week 4 of marathon training and I have a couple of marks that are like – daaaang! Definitely sunscreen. Also Bodyglide on my inner thighs to prevent any chafing from chub rub now that I’m wearing shorts instead of capris. sunscreen. my mom just died from melanoma. she was never a sunbather, and it took her very quickly. protect yourselves people! Gabby @ Marathons and Macarons recently posted…Your Best Half Marathon Advice! Sunscreen! I know this has been said already, but highest SPF possible, and slick that stuff on! I use body glide, but will be giving aquaphor a try. 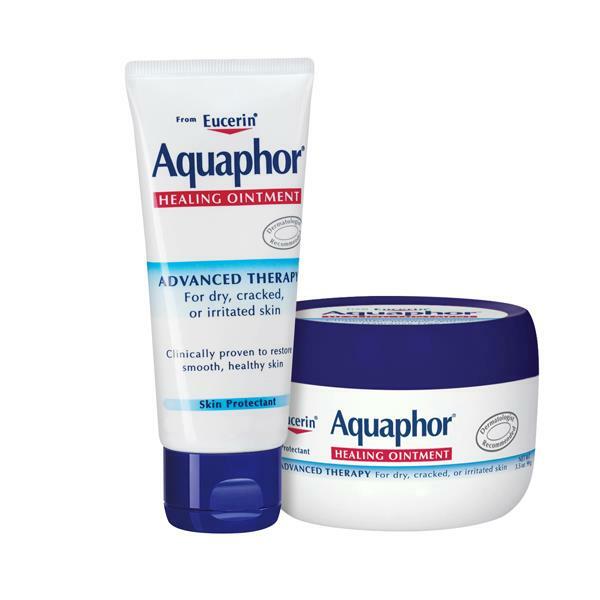 In addition to sunscreen, I use Aquaphor to soothe over-exposed skin. Wear sunscreen (and reapply it every few hours) and cover up with light-colored layers! lots of sunscreen and stay under the shade! My tip is to wear a moisturizer that contains sunscreen everyday. I put sunscreen on my face and body before long runs. For shorter runs I stay in the shade. I try to wear light colored clothing and makeup with SPF. Sunscreen in my everyday moisturizer (plus more if I’m spending extra time outdoors) and a hat! Oh I would have to say the sunscreen is most important, but also to keep your skin moisturized with a good lotion! Wear Sunscreen And Drink Plenty Of Water To Keep Skin Hydrated! Drinking water! I’m constantly dehydrated, so when I do properly hydrate, I notice my skin doesn’t feel nearly dried out! Sunscreen, and limit your exposure until you’ve built up a pretty good base :) Works like a charm! Just started using Aquaphor this year to protect myself from sports bra chafing. Also I wear sunscreen on my face everyday and try to drink a lot of water. always wear sunscreen, and try not to spend a lot of time out in the sun! I use sunscreen during the day and emu oil at night. I’ve been using Body Glide for chafing and sunscreen for the sun. I don’t really have a plan. My tip is sunscreen and moisturize moisturize and moisturize. Sunscreen and a wide brimmed hat – thank you. Always wear sunscreen and try to stay in the shade/away from direct sunlight whenever possible! I pile on the lotion in the summer after I exfoliate – it helps my skin stay super soft. I like to wear a straw hat. Moisturize with a good sunscreen. My grandfather worked outside his whole life, and he wore long pants, and long sleeve shirts. Now that I spend a lot of time working in my yard, I do the same. Sunscreen on exposed areas, a hat, sunglasses and I drink lots of water to keep my skin hydrated. Summer running essentials for me are hat/visor, sunglasses, sunscreen, Bodyglide, water, and electrolyte tabs. And running very early before the sun is strong, like 5:30 or 6:00 am start. However, while I do slather bodyglide on my feet to avoid blistering, Aquaphor seems like it would be easier to apply, so I am interested in trying this even if I don’t win. My son used to have a lot of diaper rashes when he was younger, so I certainly used a lot of Aquaphor back in those days. we apply sunblock every hour we are outside. Remember to use sunscreen, including lip balm with SPF. Thanks for the chance to win! I think in this case simple is best – sunscreen… and lots of it! My tip is to use an SPF lotion of at least 30 and to wear a wide-brimmed hat. stay in the shade and wear sunscreen! I always wear sunscreen in the summer and stay hydrated! Use lots of sunscreen every day. Drink a lot of water to keep your skin hydrated. Ooo, so glad I saw this! Year-round, I use a facial moisturizer with SPF 15, which is my top tip. No matter if I end up in the sun unexpectedly – I’m covered! In the summer in particular, I like the spray on sunscreen that Neutrogena (sp?) makes. Perfect for reaching between my shoulder blades myself! Put on sunscreen, stay in the shade, and wear loose fitting cotton clothes. Important to use all natural sunscreen…watch those chemicals! Also, moisturize right out of shower or after washing your face right on top of the water beadlets which will seal in the moisture.